Silly swimming chickens...I mean "ducks"....I mean chickens!! 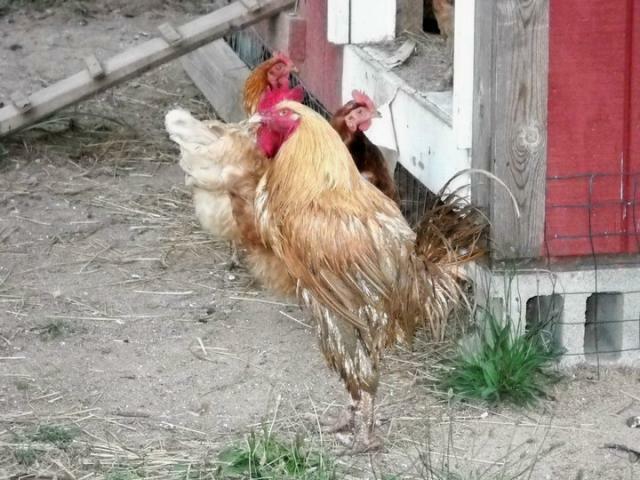 Discussion in 'Pictures & Stories of My Chickens' started by Keltara, Jul 10, 2011. I've updated this post with more photos of our ducky chickens!! Yes I know that "they" say chickens can't swim. Or chickens will only float for a few minutes and then their feathers will become sodden and they will sink. Well I'm here to let you know that their feathers may become wet and sodden, but they will not sink. They will float, swim and flap. They LOVE the pool! So who are "they" anyway?? Here are Madeline, our neighbor Riley, and Tara with all three of our girls (Dixie, Jasmine and Daisy). And the Henny Penny's just chillin' in the 92 degree heat . Excuse us...A little privacy please human! Now make yourself useful and fetch us some meal worms. These pictures were taken on 8/3/11. SeaTexan, klgm and FLMomRN like this. Your ladies came out better than my Johnny. He fell into the cow's water trough in rather cold weather. I didn't want him in the water while I ran around to go thru the gate so I reached thru the fence and tossed him out. Poor guy landed right in the mud!! That is really cool! Cute chickens. Since chickens can actually swim, I wonder why we have had such problems with them drowning in the trough? Wow! I did not know they would do this! My hens all come and stand at the edge of my pool deck and watch while I swim, but I've never thought of putting them in the water! Hot as it is here, I may try this! now those are great photos and fabulous floating birdies!!! I'm running out and getting a pool to throw them in! Just kidding but great photos! Quote:And i do believe that is the stink eye you are receiving, poor guy.